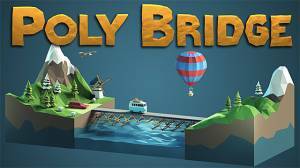 This bridge-building simulator will test your engineering creativity, it has 105 different scenarios where in each one you have to figure out a workable solution with the limited Tools you have at your disposal to get vehicles of various shapes and sizes on one side of a virtual river safe and sound to the other side. What are Hydraulics and Split Joints? No discussions open for Poly Bridge at the moment.